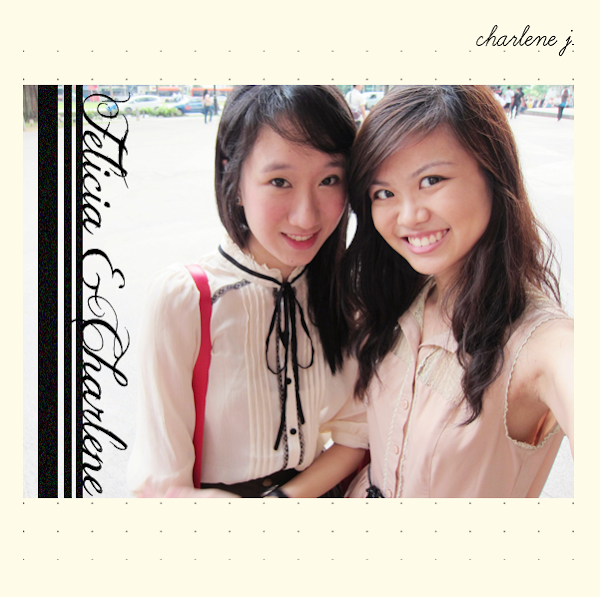 Two weeks ago, Fel and I teamed up to take part in Cineleisure's Next Online Sensation! Initially, we thought we weren't shortlisted but... We were!!! 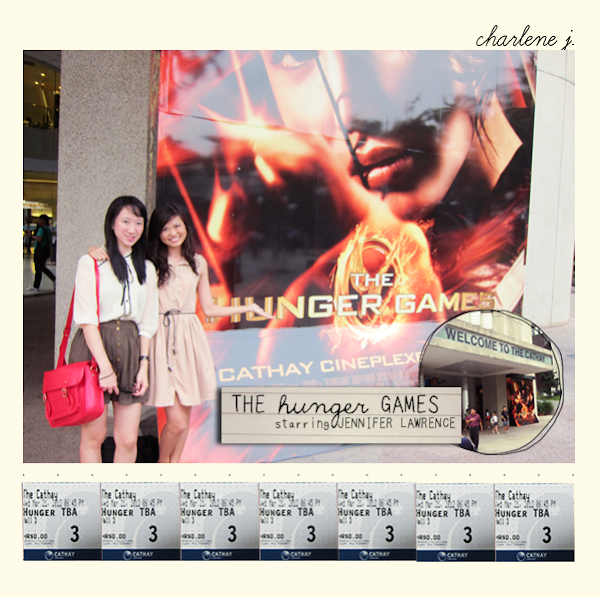 :D For our first challenge, we are to blog about how we spend our day at Cathay Cineleisure Orchard before attending 'The Hunger Games' Gala Premiere (The promotional movie posters were out last year and I have been waiting ever since!) on Wednesday's evening! Here's me! I was dressed in Love, Bonito's Mustard Kory Knit Top and New Look's jeggings. 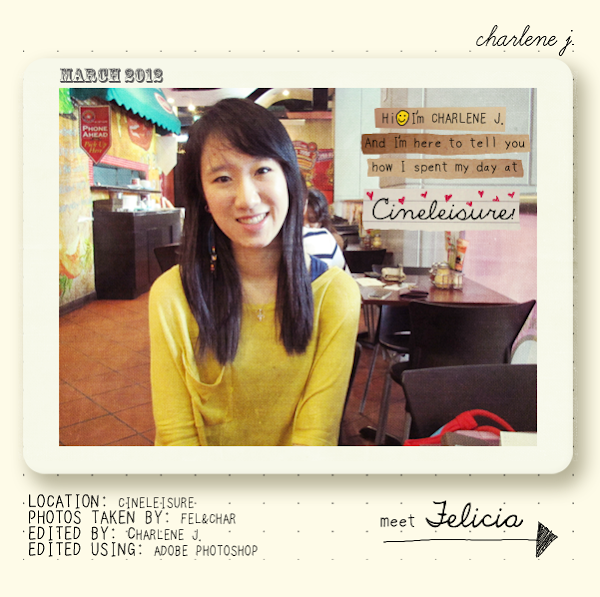 Meet Fel! Fel and I have been in the same schools all our lives (Not counting kindergartens.) but we only met in junior college. We were exempted from P.E. lessons so whilst others were running 2.4km under the scorching sun, we bonded over Taiwanese and Japanese dramas, songs and of course, eye candies! Heh. And here's how we spent our day at Cineleisure! Located at 8 Grange Road, the mall is a popular hangout among youths with its wide range of shops. It has everything that you need! Shopping? Definitely! Checked! Pasta? Checked! Japanese cuisine? Checked! Chinese food? Checked! Cheap food? Checked! Tibits? Checked! Theatre? Double checked! 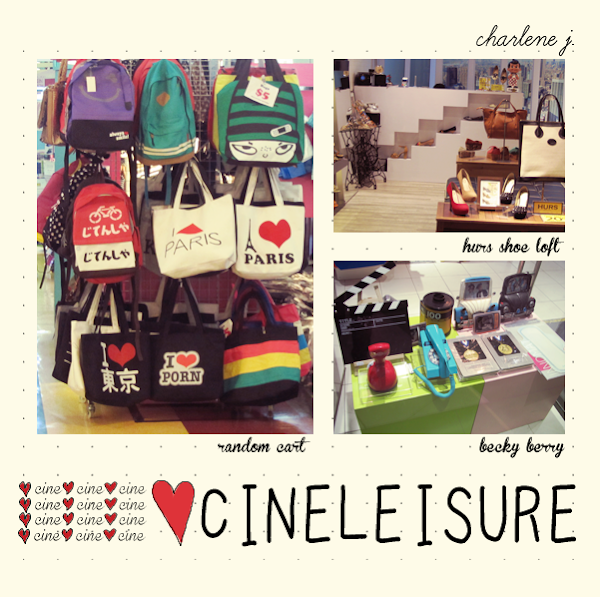 I usually go to Cineleisure for movies and I love the shops on the third floor (Read on!)! The first thing we did after we met up was to look for food! We were both famished and our tummies needed food desperately but we were so spoilt for choices that we couldn't make up our minds. 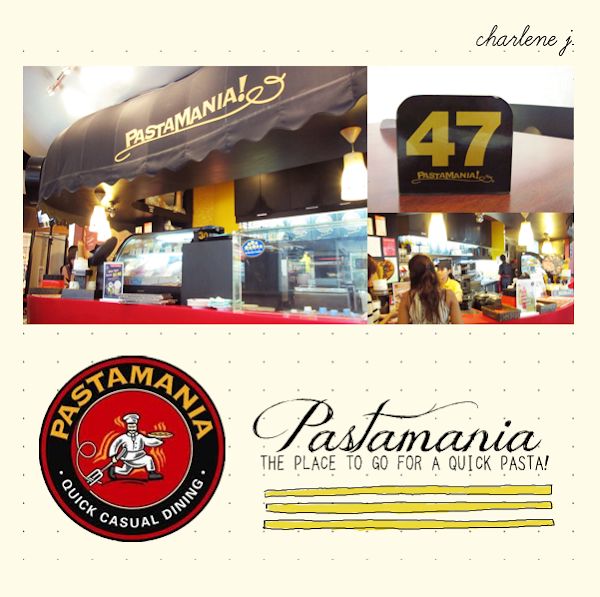 After a ping-pong discussion, we finally settled on Pastamania. It has been a while since I ate at Pastamania because I was eating so much of it in Year 2 (Can you imagine pasta for supper almost every night? I don't know how I managed that but I was so hungry. All the time. Blame the school?). But anyway, umm... I still felt hungry after that. And it didn't help (My figure.) that Shokudo - Japanese Coffee House was directly opposite Pastamania! 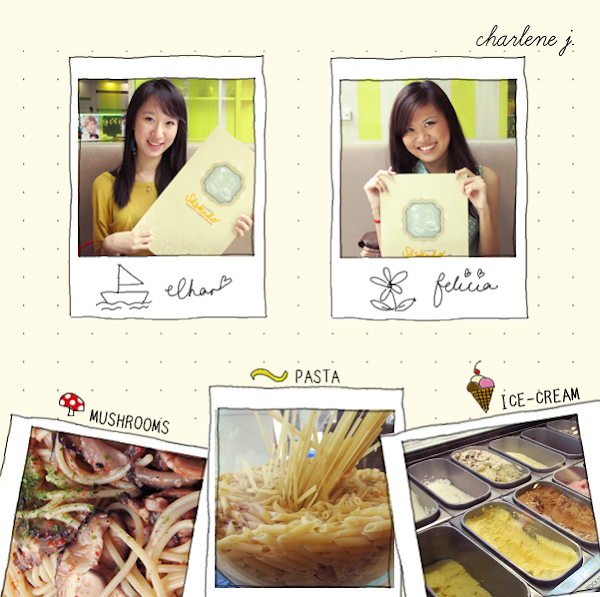 I love their Kinoko Wafu Aglio Olio! 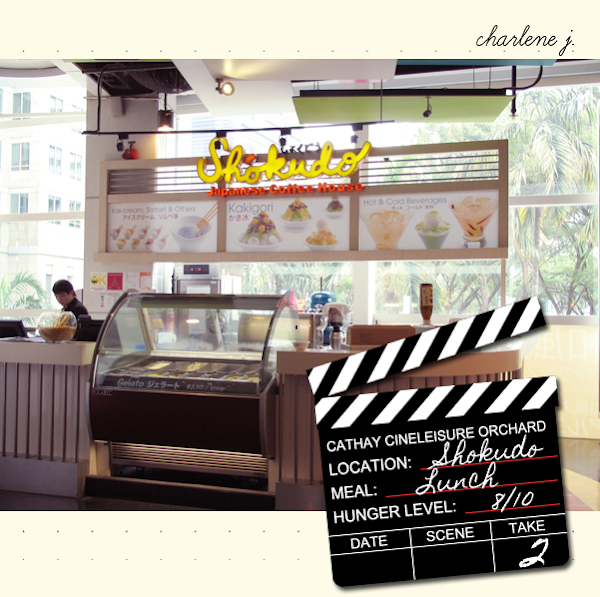 Shokudo - Japanese Coffee House is right beside the escalator and with its trays of ice-creams outside, it is pretty hard to miss! And... TADAHHH!!! My plate of Kinoko Wafu Aglio Olio! This is my third serving in a month since Juliet introduced it to me. Hahaha! We filmed a little here and it was a little embarrassing. Actually, the whole filming process was! Haha. But we were never going to see whoever who saw us again so... *shrugs*. Haha. And now, let the shopping begin!!! 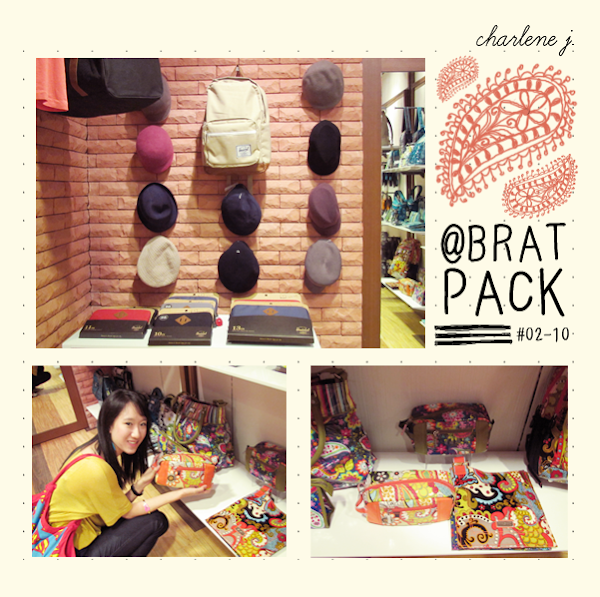 The first shop that caught our eyes was Brat Pack. 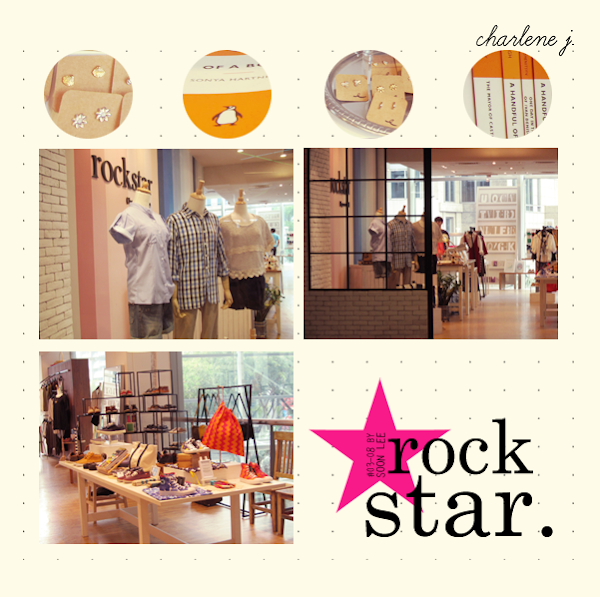 Located on the 2nd floor, the store is a burst of bright colours!!! They have shoes and clothes but what drew me like honey draws bees were the wall of hats and the very colourful pouches and bags! I don't really like wearing hats because my hair's really flat. BUT I still like trying them on! Heh. My favourite is the newsboy cap (Could have been due to my want of being a newspaper girl and having a newspaper route when I was a child! It looked so fun in Little Archie comics! Actually, it still looks fun! Haha.). The pouches had those henna designs on them. When I was in junior college, I liked those designs a lot. I printed them out from the Net and spent hours trying to draw them (I tried to draw tattoos too.). But umm... I failed Art so... Moving on! 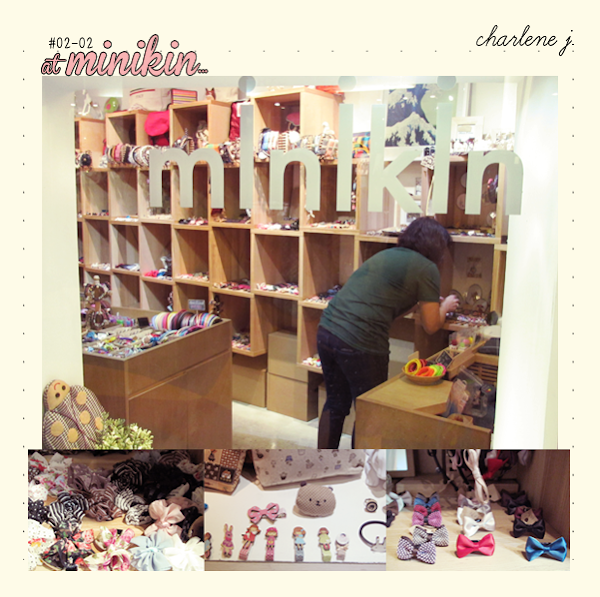 Minikin is your typical girly store, complete with pearl headbands, whimsical rings and necklaces and pretty ribbons! 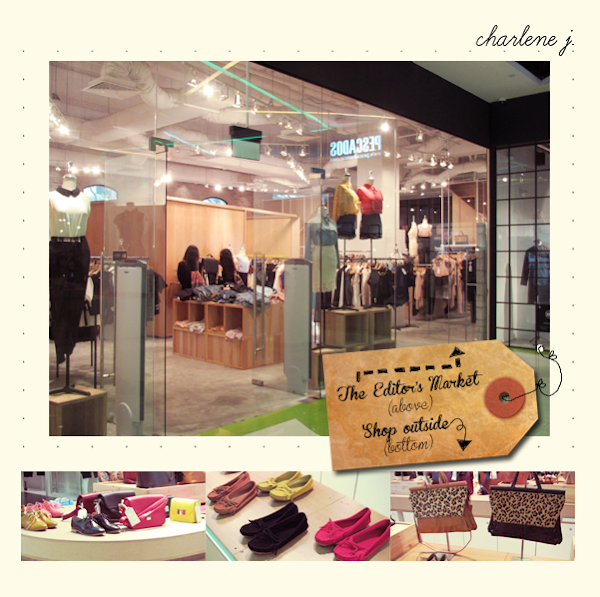 Displayed prettily in cubbyholes, a girl can spend hours there without noticing the time. Psst! 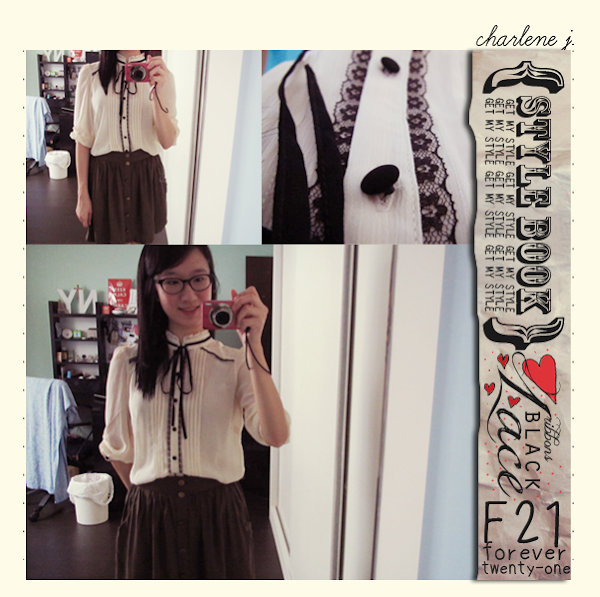 Check out Fel's entry here for the loot! This is the third floor (My favourite!) and quite possibly, the first shop that you would spot is Becky Berry! Rockstar could be the most well-known shop of all! The walls are in stripes of different shades of pink and I have long declared that my future house is going to have them too (Much to the horror of the boy.). I think the sister first brought me to this store and I have made multiple trips back. It has purses and pouches with letters printed on them, English school teacher's bags, plants in pretty containers, rows and rows of Penguin books, earrings and of course, clothes (What would a shop be without clothes?!? *laments dramatically*)! We then made our way to Sticky! 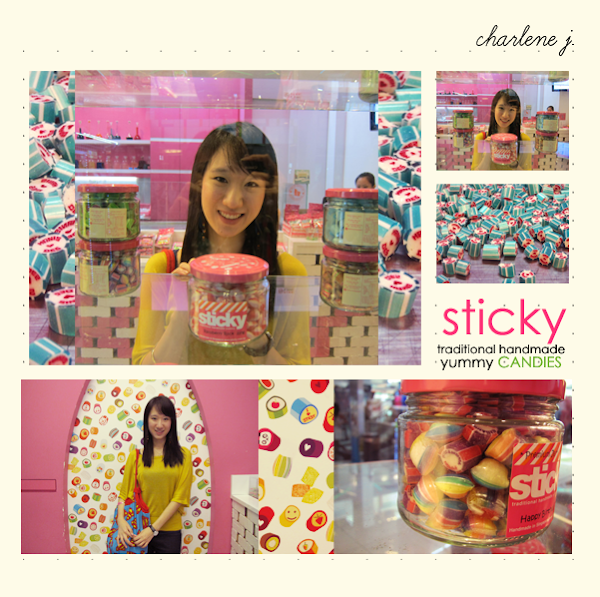 Sticky has been around for quite some time and though I have eaten the sweets, I had not seen how the sweets were made. I love food stores where you can watch the chefs prepare the food! It's like an art, to be appreciated. 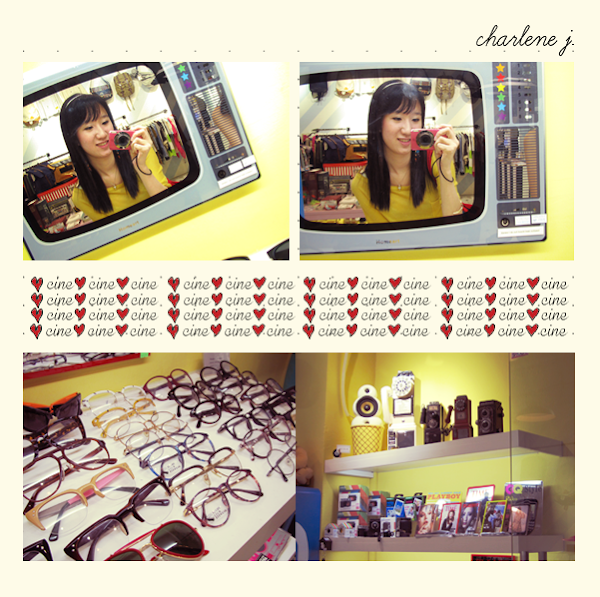 (: And oh yes, I love how colourful the store is! The man making the sweets handed us some and ka-ching! We each bought a packet. :D Come to think of it, I think I'm gonna have one right after this entry. Heh. 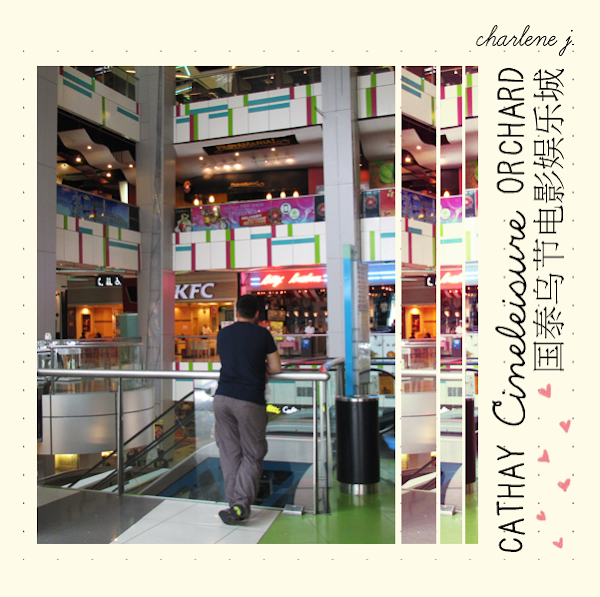 Some other stores in Cineleisure! And we mustn't leave out The Editor's Market! 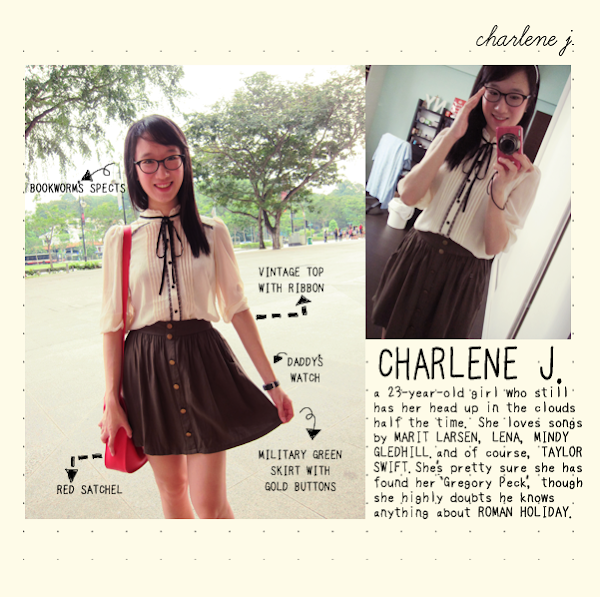 Your one-stop place for unique and Lookbook-worthy clothes! 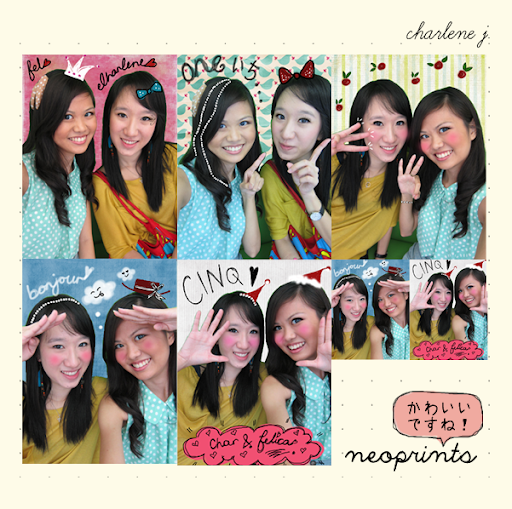 Neoprints and Anime eyes! Haha. 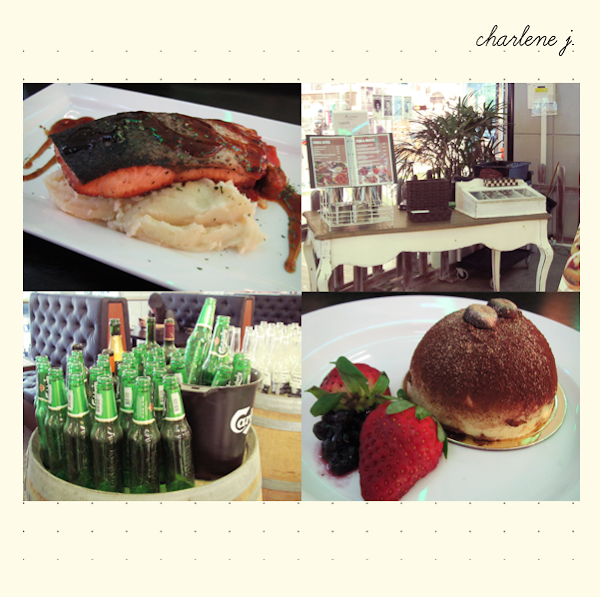 We ended our Monday with dinner at A.venue Bistro! The place is decked out in old English decor and it seemed a little like we were in a train carriage. Like in Harry Potter! Haha. On Wednesday, Fel and I attended the Gala Premiere for 'The Hunger Games'! I swear Wednesday took f-o-r-e-v-e-r to come! 'The Hunger Games' is based on the novel of the same name by Suzanne Collins. It stars Jennifer Lawrence (Mystique in 'X-Men: First Class'. ), Josh Hutcherson (The best friend with 'bad blood' in 'Cirque du Freak: The Vampire's Assistant'.) and Liam Hemsworth (Or more popularly known as Miley Cyrus' boyfriend. Haha.). Set in the post-apocalyptic world, Panem (Or North America, as we currently know it as.) is divided into 13 districts. Each year, a boy and a girl from each of the 12 districts will be chosen to battle it out... Something like 'Battle Royale' in reality television style. It serves as a reminder to these districts of the Capitol's authority and is a punishment for their rebellion. Quite frankly, I don't like the idea of the story (I'm currently reading 'Battle Royale' and I don't like it either. But it's one of those must-read books so I'm reading it. I don't think I can stomach 'Lord of the Flies' though.). 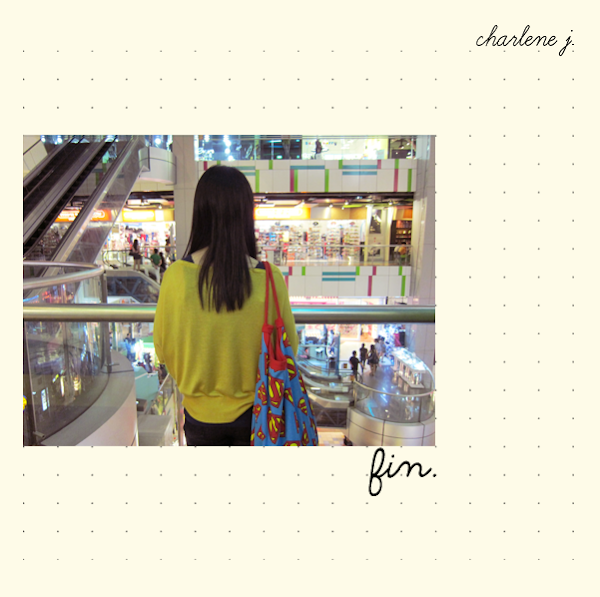 But it's jam-packed with action and I love anything that has romance. Heh. A snapshot of Fel and I before the movie!